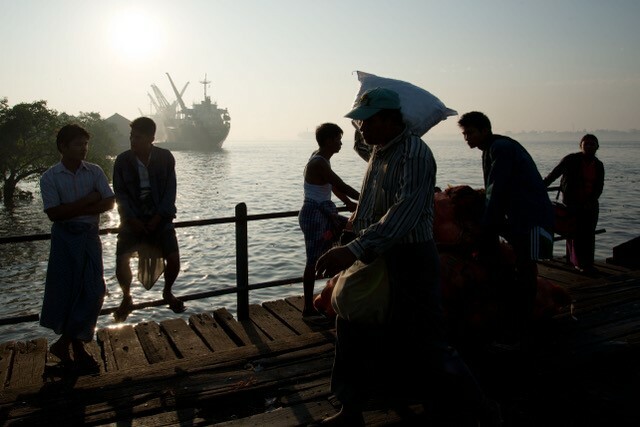 Myanmar is going through a period of major transition, not only political, but also economic and social. After more than 50 years of military rule, the first democratically elected government took office in April 2016. The country is now experiencing rapid economic growth, and there is renewed attention to social sectors after many decades of under-investment. Myanmar’s political leadership has expressed a strong commitment to accelerate progress towards universal health coverage (UHC). 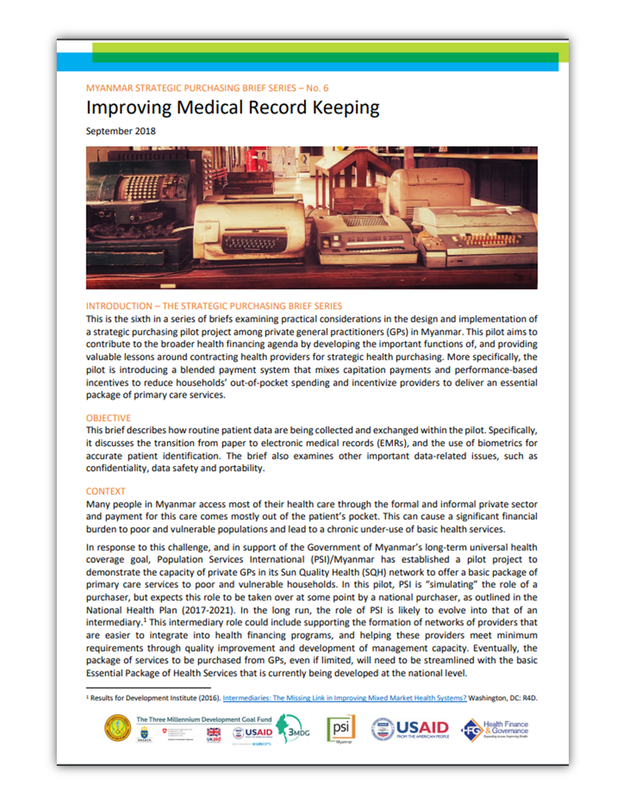 Given where the country is starting from – with weaknesses in the health system and relatively poor health indicators – achieving ambitious UHC goals will require substantial efforts and investments. How resources will be allocated and how services will be purchased, from whom, and by whom, to ensure equitable coverage of the EPHS. 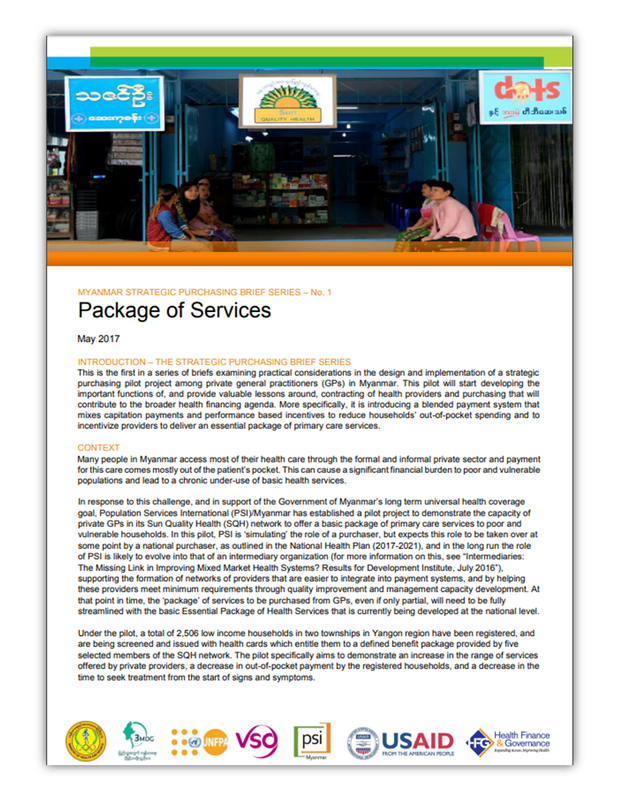 Beyond the necessity to improve the capacity of the public sector to deliver health services, the NHP identifies that it needs to increasingly engage and oversee service providers outside the public sector – private general practitioners (GPs), non-governmental organizations (NGOs) and ethnic health organizations (EHOs). This requires the development of new skills and functions, including contracting, purchasing and accreditation. 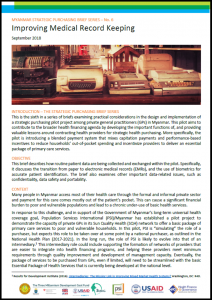 International non-profit Population Services International (PSI) runs a large social franchise in Myanmar –i.e., a network of GPs that are linked through agreements to provide specific health services meeting agreed-upon quality standards under a common franchise branding. The franchise aims to improve and standardize quality of care among private GPs. This network offers a suitable platform for examining the potential role of the private sector in supporting the government’s efforts to move towards UHC in line with the NHP. 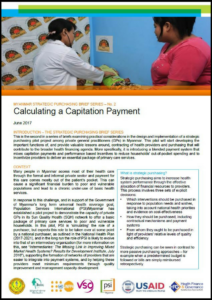 In 2017, PSI launched a strategic purchasing pilot project whereby it simulates the role of a health purchaser and uses a mix of provider payment mechanisms to introduce financial incentives that motivate the provider to adopt behaviors that are in line with the objectives of the health system. 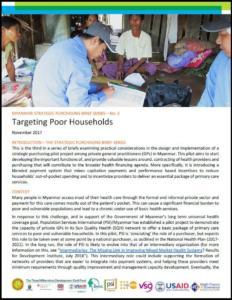 This experiment involves a small number of GPs based in the Yangon region who have agreed to deliver a broader package of primary care services to a targeted population that was identified by PSI as poor and that registered with those GPs. 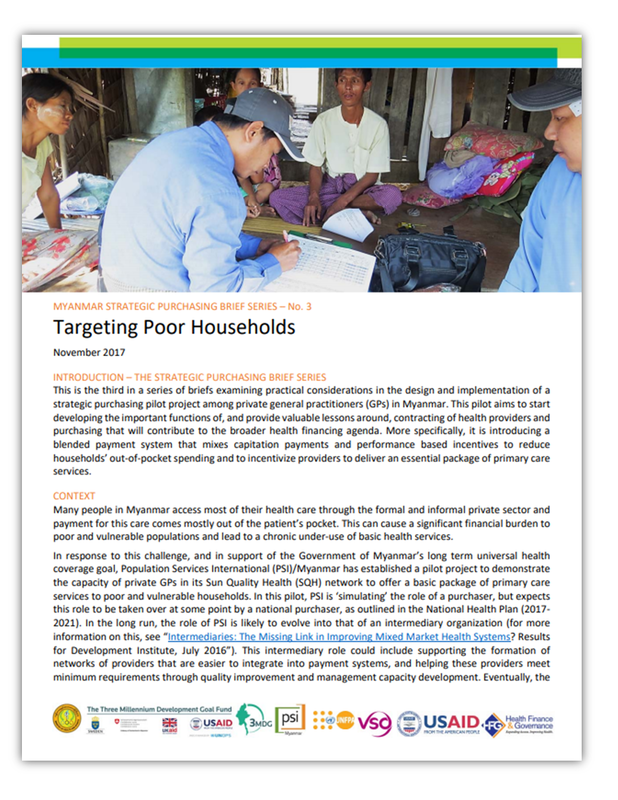 The package mirrors, to a large extent, the services and interventions included in the Basic EPHS. 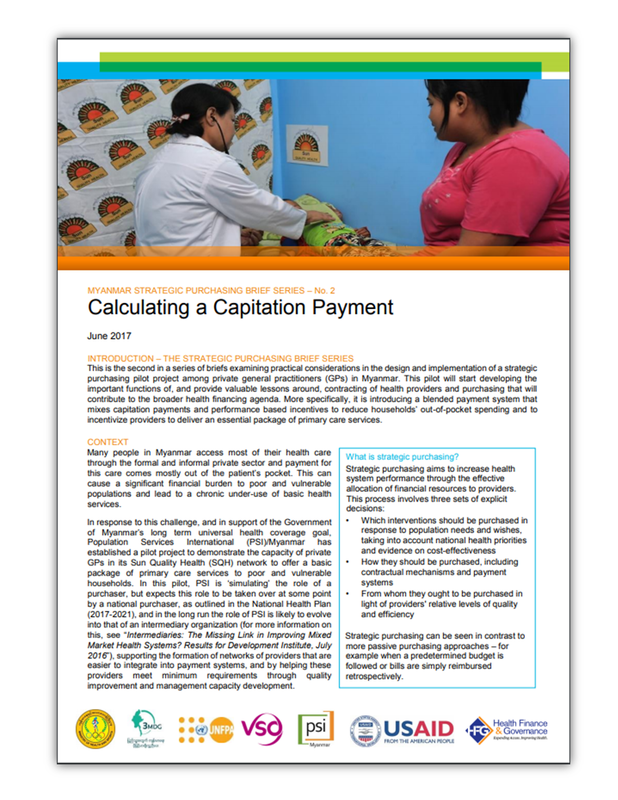 PSI purchases this package of services from participating providers on behalf of registered clients using a combination of capitation payments –whereby the provider is paid a fixed amount per year for each client registered with him/her that is unrelated to actual service utilization by that client– and performance-based incentives –whereby the provider can earn a bonus of up to 10% of the total capitation payments if he/she meets certain targets, such as achieving a score of at least 70% on a quality scorecard–, thereby largely replacing the prevailing system whereby patients pay for services out of their pocket on a fee-for-service basis. Non-poor patients continue to pay out of their pocket, even for services and interventions included in the package. This pilot project is expected to generate valuable lessons. The skills that are built through the pilot will subsequently be transferred to a semi-autonomous purchasing entity that will expand, replicate and adapt similar purchasing arrangements with the different types of providers, including in the public sector, while further strengthening the key functions of a purchaser. 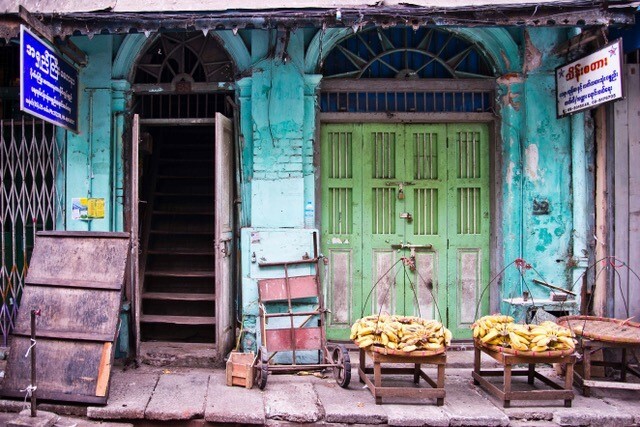 Since the design phase of the strategic purchasing pilot project, USAID’s Health Finance and Governance (HFG) project has been working closely with PSI to build implementation research into the pilot project. The main objectives of the implementation research are to document how and why certain design choices were made, to help identify areas where corrective measures can be taken to improve implementation, and to inform both the future rollout of strategic purchasing to other providers and the future take-over of the purchasing function by a government or parastatal entity. The implementation research will also help assess and understand the context in which the pilot project is carried out, how the context shapes and interacts with the intervention, and how the design of the intervention may need to be modified to better fit the local context. Such understanding will be critical for the subsequent rollout mentioned above. Facilitate planning and resource mobilization for subsequent scale-up. 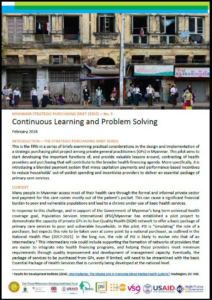 In order to ensure the implementation research supports a long-term strategic purchasing strategy, HFG is helping to establish a Scale-Up Management Team, which brings together representatives from key stakeholders, including MoHS, the Myanmar GP society, development partners and civil society. The role of this team is not only to oversee the implementation research but also to learn from this pilot and support replication in other parts of the country and expansion. The team will also be able to formulate recommendations on the potential future assumption of the purchasing function by a government entity. 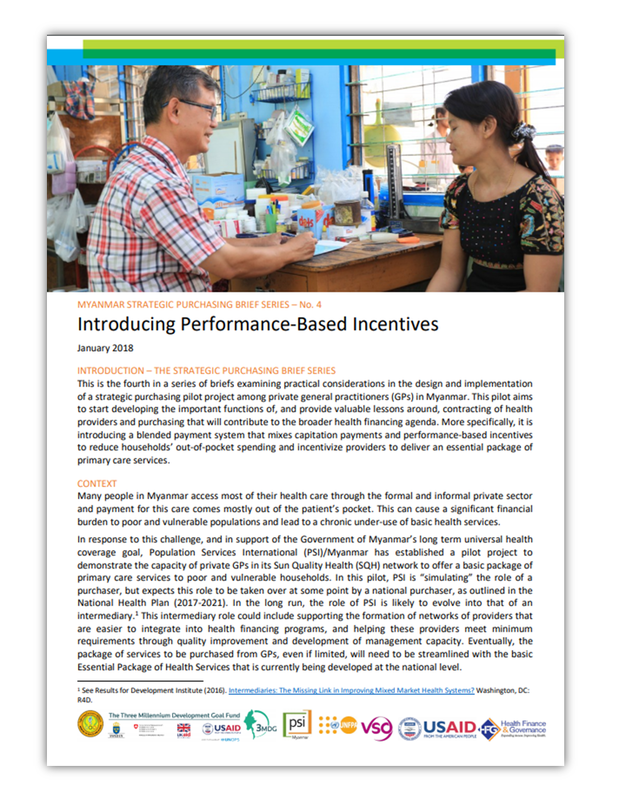 HFG is also building on this first experience to further promote and institutionalize implementation research, not only around the engagement of private sector providers in the context of UHC but also around other initiatives that contribute to Myanmar’s move towards UHC and that are part of the NHP. 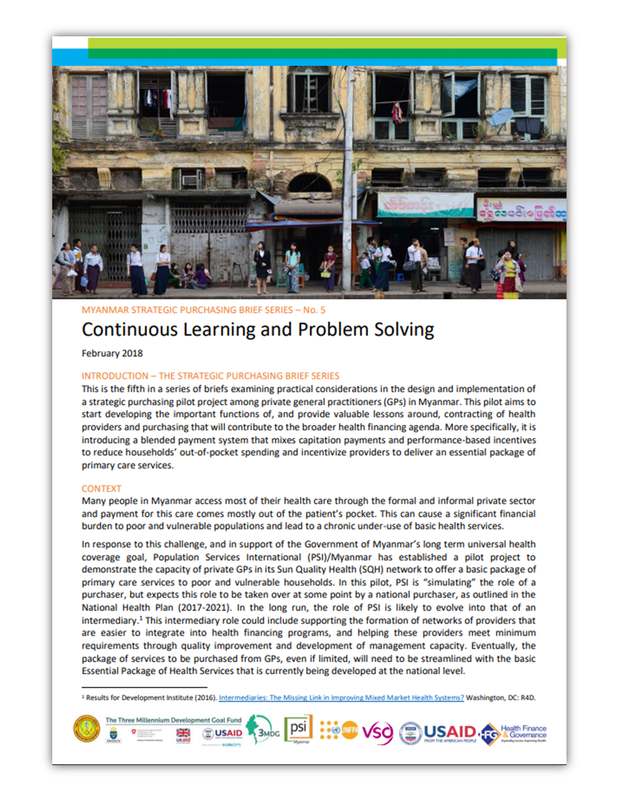 You can read more about implementation research for UHC in a series of briefs that detail the experiences of Indonesia and Myanmar. 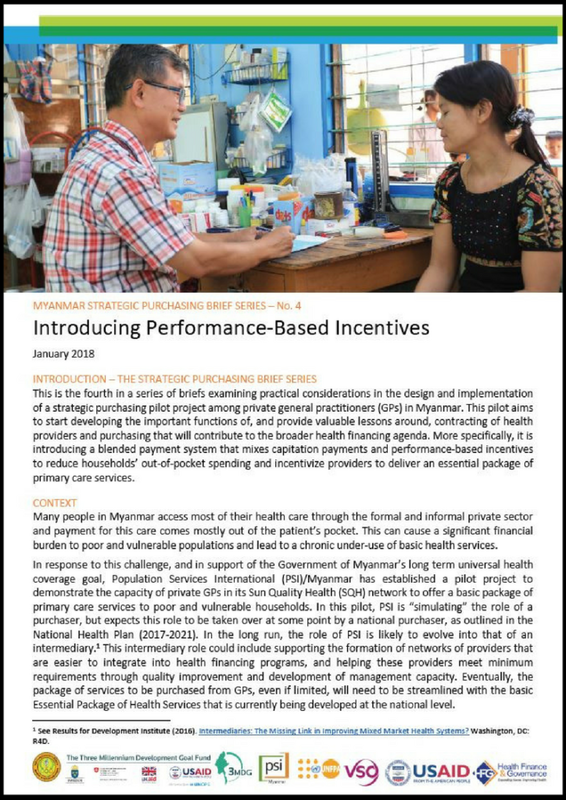 Lessons from the strategic purchasing pilot and implementation research in Myanmar are highlighted in briefs that were prepared jointly by PSI and HFG, with input from other key stakeholders. Each brief examines practical considerations in the design and implementation of a key component of the pilot.